Nursing yourself back to health from a cause that may have resulted in way too much pain than what can possibly be tolerated by a person under normal circumstances, is never as easy as perhaps, nursing a flat tire in your vehicle. There are times when people suffering from causes like rheumatoid arthritis, fractures, slipped discs etc. had tried to wish their pain away or wish themselves away for that matter, as a desperate attempt to emancipate them from the overbearing rather excruciating pain. For all you know, on earning such debilitating causes of pain, one can take it for granted that the journey will never been smooth sailing or completely pain free even with medication, at least in the first stages of managing the issue. Under such circumstances, certain rebellious patients make drastic attempts at doing away with their troubles instantly, by becoming their own doctor. It all starts with recommending oneself with over-dosage of strong pain medication especially those that are prescription drugs; substances that are sure to come with side effects when used wrongly. In fact, this has so far been one of the most common ways of self treatment of chronic pain, but with more of adverse effects than otherwise. Assuming the role of one’s own pain management doctor especially when degrees and diplomas in the concerned field are strictly missing is something like a crime being committed against oneself. Being guided by no other motive than the urgency to be relieved of the ordeal, counters the very purpose of pain-control followed by the negation of any long term successful outcomes. Till date, a number of cases have come into light where the concerned individuals perpetuated the cause of the pain and added a few more to the existing list by trying to doctor themselves through the torment. 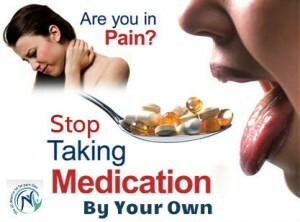 Using prescriptions offered by certified doctors in ways not prescribed is but the beginning of the drama. Patients have also been seen to go further into obscure directions as their chosen ways of pain management. Approaching psychic healers and witch doctors; approaching wizards and using hex bags have surprisingly made their impact felt in certain otherwise upcoming modern cultures of certain parts of the world. Crowning the World Wide Web as an infallible source of all solutions has added to the concern of real doctors. Relying on certain obscure write-ups that may have been floating around offering quick tips and effective reliefs from impossible tribulations seems to impress those in the process of earning on-the-spot pain relief. If this source however, is used to launch a search for some very qualified, certified, noted and successful pain management doctors, patients are sure to have a greater chance at quicker relief. In very simple words, it is wise to experience a little pain while relying on qualified doctors and therapists to chalk out a route to complete healing of the root cause which is causing all the trouble in the first place. There is basically, no shortcut to relief from chronic aches. It is best to walk the charted path than suffer more in the longer run.